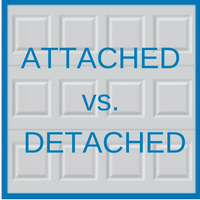 There are various pros and cons to consider when deciding if an attached or detached garage is best for your property. The most important question to ask yourself is: “What will the main use of the garage be?” This can be determined by the number of cars you own, how much storage space you need, and safety exits you wish to provide for your family. There are benefits to both attached and detached garages, however, sometimes the cons can outweigh the pros. You can determine what type of garage is right for your needs after comparing all possible scenarios. Adding a patio or deck above the garage to host parties or have people over. When living in a city, space can be limited, so this allows you to add more space if you don’t have a back or front yard. A detached garage is easier to expand than an attached garage, as long as you have a permit to do so. Storage space can be added, which can be used if you have limited space in your home. If you like to work with machinery in your garage, then having a detached garage is beneficial because it limits the noise level for those who live in your home. The main con of a detached garage is having to walk through inclement weather. Snow, rain, and other elements can be a hassle. It may be further to carry groceries and unload other items from your car with a detached garage. The convenience of being able to access your garage through your home. You can save money if you build an attached garage because there are preexisting walls to use to build upon. Extra storage space is also an advantage of having a garage in general, regardless of it being attached or detached. Zoning may be an issue because obtaining a permit for an existing structure tends to be more difficult and costly. Having a garage attached to your home can cause a high security threat to you and/or your family if someone tries to get in. If you are trying to decide between a detached or attached garage and need guidance when doing so, contact the specialized team of garage experts at Blue Sky Builders for assistance. Call 630-852-8485 or visit Blue Sky Builders online today to discover more about the variety of services we offer.